Sunset in Montgomery Center on September 6. On Aug. 29, VPR’s Tell Me More Tour visited Orleans County, hosting a public event at the NEK Tasting Center in Newport. On Sept. 6, VPR visited Franklin County with an event at Montgomery Center For The Arts in Montgomery Center. 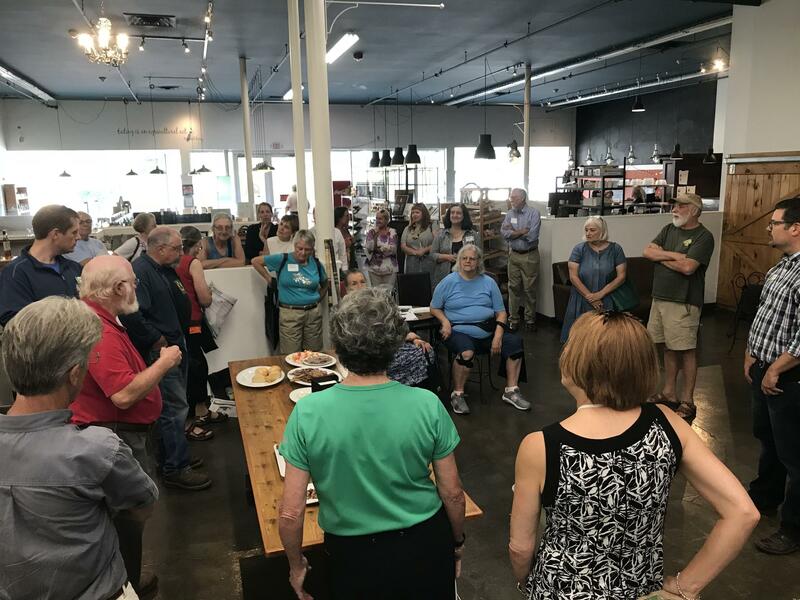 I really thought no one would show up to the Tell Me More Tour event on September 6 in Montgomery, in eastern Franklin County. It had been a busy week at VPR between the live hearings of Brett Kavanaugh’s Supreme Court confirmation hearings and the release of our new podcast Jolted, so we weren’t able to promote the event on the air as much as we’d originally planned. 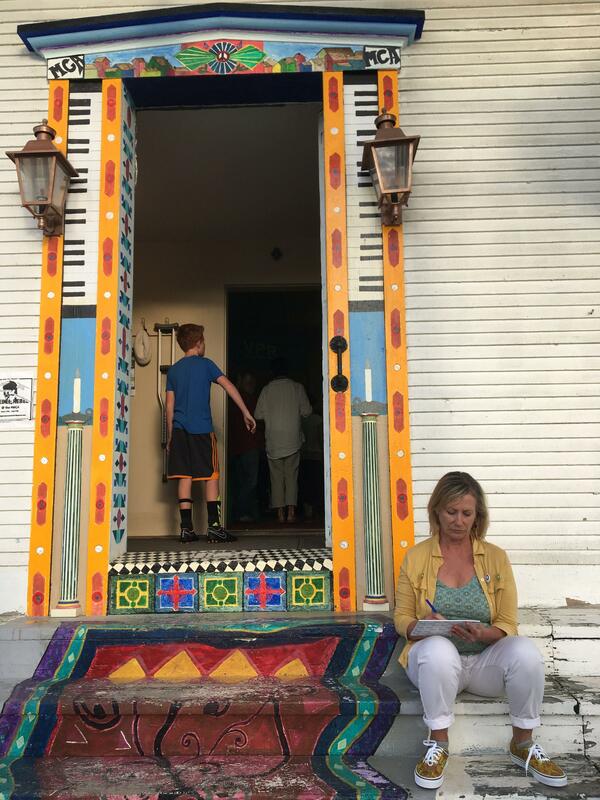 Melissa Haberman catches some fresh air and writes her thoughts about Montgomery and VPR. But our host, the Montgomery Center for the Arts, did a tremendous job getting the word out. More than 40 people showed up - no small feat in a town with a population of just about 1,200! We found out what is important to this community is...the community itself. This small town at the foot of Jay Peak is full of ski enthusiasts, hippies, entrepreneurs, farmers, artists and retirees. We met teachers who were fighting a plan to consolidate the town’s school district (they said it would cause kids to be on the bus too long, and not really save money). We also heard about an ongoing community debate about how much policing is really needed, and how much they can afford. Montgomery has a great story to tell the rest of the state - if we’ll listen. So does Newport, another northern Vermont town where many residents feel misunderstood. 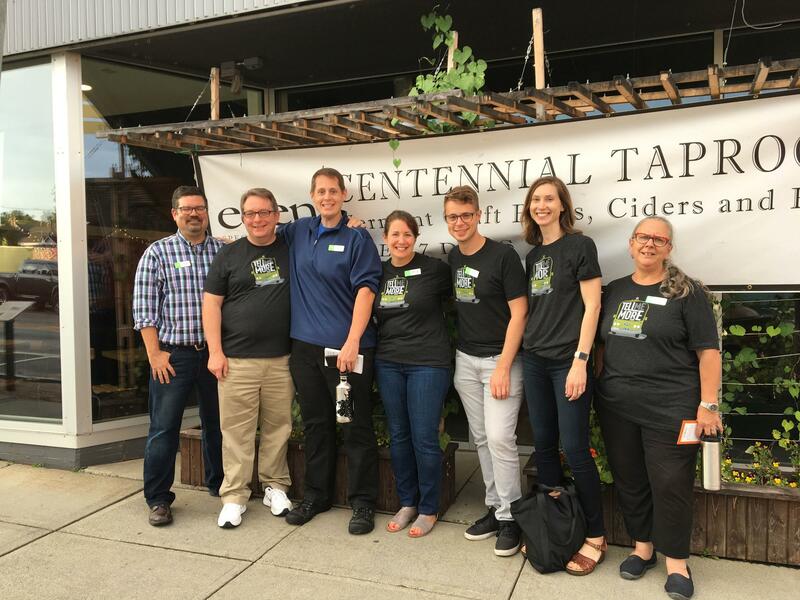 We had another crowd of about 40 at the Northeast Kingdom Tasting Center in late August - a cool shared space in downtown Newport for food and drink makers. Newport sits on the shores of beautiful Lake Memphremagog, which is bisected by the Canadian border. But two events - September 11 and the more recent EB-5 scandal - have done a real number on economic development. The crowd at the NEK Tasting Center in Newport had a lot of input about their town and how it's perceived around the state. Post-September 11, travel between the U.S. and Canada became much more difficult - hurting Newport’s tourist and retail trade. And as a result of the EB-5 scandal, a planned development for downtown never was built. In the heart of downtown, there’s a large hole surrounded by a fence. “We’re more than just a hole in the ground,” one guest pointed out. Newport is making a comeback - with a new bike trail and bringing back The Northern Star cruise boat. People we met in both Newport and Montgomery want us to talk about their fight to improve their community, not just the problems they face. It’s something VPR is thinking more about as we start the second half of our statewide Tell Me More Tour. The VPR crew in front of the NEK Tasting Center on August 29. Update 2/22/19: We've published a summary of our tour and what we learned here. If you didn't get to attend an event in person, you are always welcome to reach out with your ideas. Please contact us anytime here. On Aug. 17, VPR’s Tell Me More Tour visited Essex County, hosting an evening event at K.T. Ray’s On The Pond in Island Pond. Smartphones, smart speakers — when you listen to Vermont Public Radio, you’re hearing at lot about all these “smart” devices. But what if you can’t afford these gadgets? What if you don’t have the internet at home or use email? Should that make you feel “dumb"?